Keep toenails trim and tidy with Tweezerman's G.E.A.R. 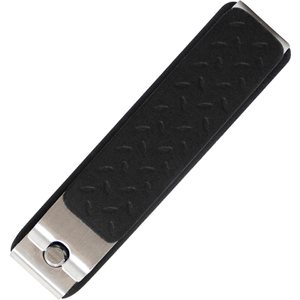 Precision Grip Toenail Clipper. Crafted from stainless steel with a textured, non-slip grip, the nail clippers feature sharp, cutting edges with a straight blade to trim even the toughest of toenails whilst preventing splitting. For easy clean-up, the case catches clippings and slides open to be emptied. - K.N. For best results, soak toenails before clipping to soften. Trim toenails to desired length. Clean blades after each use.